4-20mA SENSOR TRANSMITTERS - Robert Owen Inc.
Use spare PLC 4-20mA inputs for sensor measurement, with ROI-XMA transmitters. ROI-XMA sensor transmitters allow the simple measurement of industry standard sensors. Existing sensors can be connected to modern control systems. Read Thermistors, RTDs, or Potentiometers with a PLC. ROI-XMA 4-20mA sensor transmitters are a simple way to add temperature sensor measurement and position sensor measurement to a PLC. 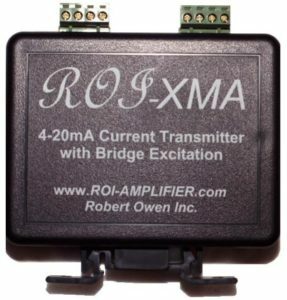 The ROI-XMA sensor transmitter is a versatile family of loop powered 4-20mA sensor transmitters. Available for a variety sensors including Thermistors, RTDs, & Potentiometers. They are simple to use and simple to install sensor amplifiers. Pluggable connections and pluggable mounting. Unit is purchased scaled ready to use, sensor change is converted to 4-20mA. Can be used with: data acquisition systems, PLC systems, SCADA systems, and more. Versions can be provided for scaled to a meet custom requirements. Signal range can be custom scaled to alternate spans within sensor range. 10K NTC Thermistors, PT100 RTDs, or PT1000 RTDs; either the RTD or the Thermistor is a simple way to add temperature sensor measurement to a PLC. String pots, linear and rotary potentiometer position sensor measurement; the potentiometer is a simple way to add position sensor measurement to a PLC. Not seeing 4-20mA sensor transmitters you’re looking for mentioned?